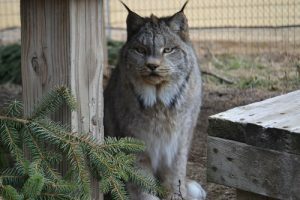 Kitty, a Canada Lynx, was rescued by a woman when she saw Kitty being mistreated. She brought Kitty into her family and took great care of her. But when the family had to move for work, they were stuck with a difficult decision. 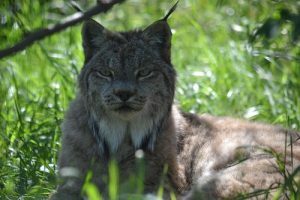 Though Kitty was legal to own in their current town, it was illegal to own a Canada Lynx in the town they were moving to. This happens so many times to people who own exotic animals. Though it might be legal when they get them, laws change, families are relocated or split up, and the animal is left homeless. Luckily, this family did quite a bit of research. They made an emotional decision to place Kitty in a sanctuary. After even more research into healthy and happy sanctuaries, they chose to contact us at The Wildcat Sanctuary. They accompanied Kitty on her arrival to help her make a smooth transition and they continued to sponsor her for several years to make sure she continued to get the best care. This is very rare since most owners rarely continue to help with the expenses of their cats once we take them in. Kitty now loves her new home at TWS! She’s a wonderful little girl who loves to sit in her hammock, sun bathe on her platforms, and roll in the new spring grass. She also loves watching her bobcat and lynx neighbors run around and play, though she would never want to join in on the action. She’s much happier sitting in the grass or sunning herself on her highest perch. If you’d like to help by sponsoring Kitty, it would help tremendously. Please visit our Sponsorship page here for more information about our program.